Having a good ear for music really means having a good brain for music. It requires the combined efforts of the ear and the triune brain for us to hear music (the simultaneous processing of melodies, rhythms, and harmonies plus the manipulating of complex patterns of sound). The basic mechanisms for recognizing individual sounds are hard wired into the human nervous system. These mechanisms take the cacophony of sensory stimuli reaching our ears and stimulating our skin and group them into meaningful chunks that we experience as coherent music. The groups of sound are fused together according to place in space, which forms the basis for seating similar instruments together in an orchestra. Tones that are closer in pitch are grouped together so we perceive harmony. Other tones are grouped in a manner that help us to experience tempo and timbre. Sound waves result from the alternate compression and decompression of air molecules. Sounds that are heard most acutely by human ears are those from sources that vibrate at frequencies between 500 and 5000 hertz (one Hz equals one cycle per second) although the entire audible range extends from 20-20,000 Hz. Speech sounds contain frequencies mainly between 1000 and 3000 Hz. The high “C,” sung by a coloratura soprano, has a dominant frequency at 1048 Hz. The frequency of the sound vibration is known as its pitch. One musical tone can consist of 20-30 different frequencies. The greater the frequency of vibration, the higher the pitch. The greater the size or intensity of vibration, the louder the sound. The auditory cortex helps to simplify incoming auditory data, suppressing noise, and sharpening the edges of important components. We begin to detect pitch after 13 thousandths of a second, loudness after about 50 thousandths, and timber at around 100 thousandths of a second. The outer ear or pinna (Latin for feather) amplifies sounds by funneling vibrations into the ear canal. The ear canal, approximately 1 inch in length, conducts the airwaves to the eardrum, which resonates to boost the frequencies. In response to the faintest sound the brain can decode, the eardrum moves only the width of one hydrogen atom. 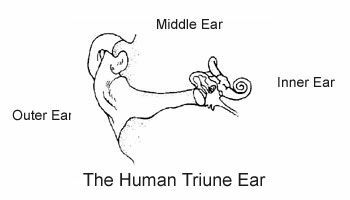 The middle ear contains three tiny bones called ossicles. They mechanically move in response to the trigger of the vibrating eardrum and transmit the sound wave data to fluid in the inner ear. The middle ear is fitted with a braking system to prevent as much as 2/3 of very loud sounds from reaching the inner ear. The braking reflex begins within 1/100th of a second of the onset of the sound, but can require up to ½ a second to achieve full force so it’s not very helpful for sudden noises such as gunshot. In addition, the brake muscles can become exhausted by long exposure to very loud sounds (e.g., construction noises, factory sounds, rock concerts). There is some decline in the upper limit of our hearing as we age (e.g., presbyacusis), connected with a slight shrinkage in the cochleae that form part of the inner ear. Outside of that, hearing loss usually involves some type of nerve malfunction in the processing of vibrations. Prolonged exposure to loud sound is a prime culprit. The inner ear, also called the labyrinth because of its complicated series of canals, converts sound vibrations into information that can be decoded by the brain. Think of it as the concert hall of the nervous system. Both the middle and inner portions of the ear are enclosed in the hardest bone in the body. Although both temporal lobes of the thinking brain can decode sound, the tracks divide unequally once they leave the ear. The broader path connects the ear to the opposite hemisphere, the smaller path connects to the hemisphere on the same side as the ear. This means that sounds entering the right ear are more likely to be decoded in the left temporal lobe and vice versa. In addition, each hemisphere orchestrates different functions related to sound. The left deals primarily with the identification and naming of sounds while the right is more concerned with the musical quality of sound including rhythm and melody perception.